My grandmother is an excellent tea-maker. Her mother was a very proper English-woman and passed along the art of making tea to her. It was a process and I grew up participating in it as though it was ritual or rite of passage. I loved it. First, my grandma would warm the tea pot with hot water, she said tea would stay hotter this way. She was precise in how she put the kettle on, she used silver spoons to help cool the tea in the cup, and she showed us how to use saucers with poise and charm. We always had access to her best china. Whether the English-woman in her approved or not, the grandmother in her let us put in an extra cube of sugar, or two. Tea and marmalade toast will always take me right back to those moments with my grandmother. They are treasured memories. What sets apart my relationship with my grandmother to others is her intentionality. Tea is a simple thing, but served with intentionality it becomes a memory. She made a moment in time something to be savoured and marked. I remember the tea, but I also have very fond memories of her. She holds a beautiful place in my heart. Intentionality is key to so much of what we enjoy in life and sets us up for the Good Life. We do not need to be wealthy or famous to have the Good Life, we need to be intentional with the life we have. When we are intentional about how we live and share our life with others, we are renewed as people and invited into the beautiful life we did not know was ready and waiting for us. Stanley Hauerwas said that “Community depends on the people having something to do together, to have a clear good that you are about is absolutely crucial.” Our communities and neighbourhoods depend on intentionality. When we do a good thing together we find that there is more happening in our midst than we first saw. Our neighbourhoods become beautiful to us when we see it through the eyes of intentionality. 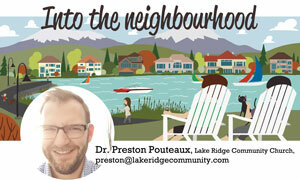 Families, kids on bikes, stray cats, BBQ suppers, and even yard work may seem like the mundane stuff of neighbourhood life. These community rhythms, when done with intentionality, become the places and moments where our very best memories are made. So whether you are making a cup of tea with your grandchild or sharing a tool with your neighbour, may you discover the joy of being intentional in all that you do. A life of intentionality will open doors, lead you into new joy, nurture your faith, and comfort you in sorrow. Your life is valuable and you are here for a purpose. You were intentionally made out of love and for love, and so was your neighbour. My grandma taught me that.